Now that summer is officially here, all the local farmers’ markets are in full swing. Here’s the post from last year that lists the Toronto area markets by days of the week. For those looking for markets in other parts of Canada, you can simply use our Find Local Food tool. Just type in your postal code, the distance you’re willing to travel, check off “Market”, click “Search!” and Voila! It’ll show all the markets in your area on a map. We’ve been enjoying the local organic strawberries from our CSA. Unfortunately, the wildlife in our backyard got to the one(!) strawberry in our garden before we did. We got our first garlic scapes in our CSA share this week, I think I’ll make spinach and garlic scape pesto with it tomorrow. Yesterday, Tanny, Ella and I went down to The Stop’s Green Barn Market near Christie and St. Clair. It’s not far from our house and with our CSA deliveries on hold over the holidays we were tired of staring at empty produce bins in our fridge. It’s a nice little market. Everyone is super friendly. It’s bigger than the market at Distillery (at least the last time we were there) but not as big as the market at the Brickworks. 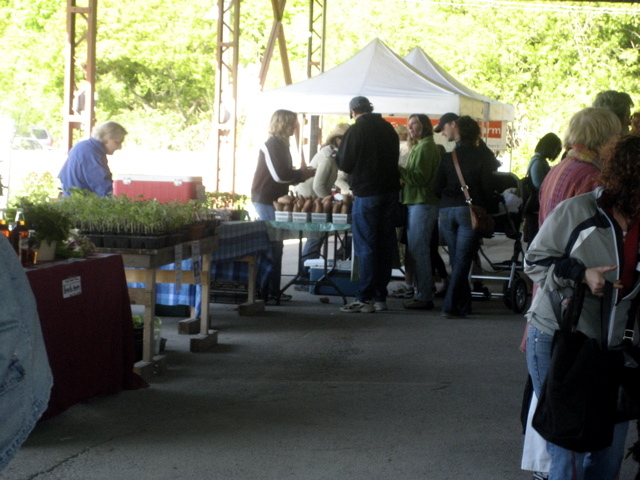 The market is held at Artscape’s Wychwood Barns – a converted TTC streetcar repair barn. It looks a bit like the Distillery Farmer’s Market, though much much smaller; the Distillery is also an Artscape project. The Stop, which runs the market, is an organisation which works to increase access to healthy food. We picked up some sweet potatoes from Round Plains Plantation. They have Tanny and Ella’s favourites: Chinese purple sweet potatoes. They also had O’Henry sweet potatoes of which we bought one to try. We got some eggs and ground beef from two vendors and some white potatoes as well. That night we made sheppard’s pie with the ground beef and potatos and it was delicious! They potatoes were the most favourful we’ve had in months. p.s. We left our camera at my parent’s house at Christmas so the blog will be pretty textual for a while. It’s been a few weeks since we’ve updated the website since we were vacationing on the beautiful island of Kauai in Hawaii. It’s the furthest accessible island (the furthest is off-limits) and the least developed. Lots of hiking, kayaking, beaches, etc. Surprising there are a lot of chickens! They’re as populous as squirrels are here (but at least squirrels don’t crow at 3am!). We rented a cottage in the midst of farmland and plantations and a long walk to the beach. It was blissful. Ok, so what does this have to do with local eating? Well, we maintained (and probably improved) our local eating habits on this vacation. 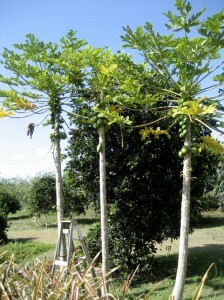 The property we were on had mango, papaya, banana, orange and breadfruit trees. There is at least one farmer’s market on the island every day which rounded out our kitchen with pineapples, lettuce, corn, cucumbers, eggs and more. Local meat was a little harder to confirm. We ate pork chops, chicken and fish. The fish was definitely local but the poultry and pork was origin-unknown. The oddest thing we saw was a tomato from Canada!!! How can that be economical? 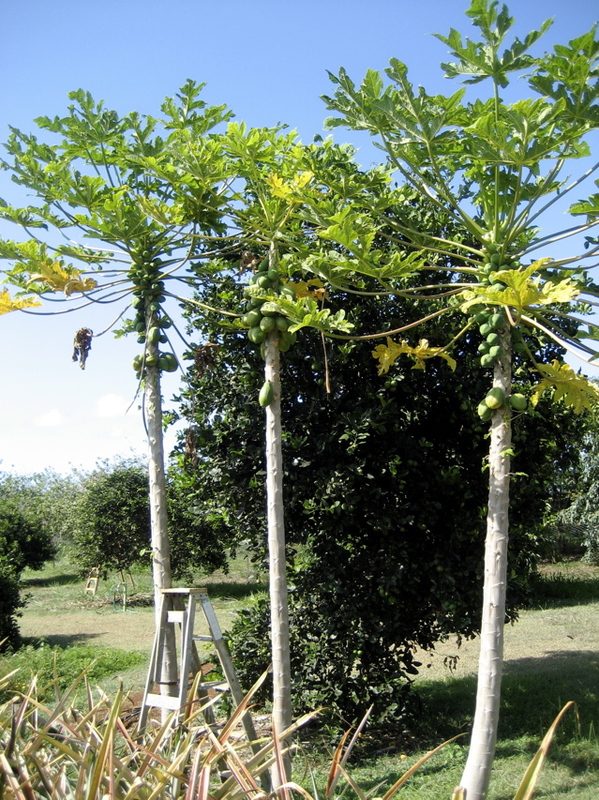 We were fortunate to be given access to a local organic fruit farm for a quick tour and saw pineapple bushes. 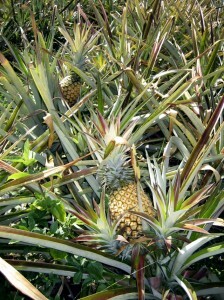 We learned that it takes 20 months to grow a pineapple and you only get a single fruit from each plant. It’s no wonder we don’t see Hawaiian pineapples in Canada – they would be ridiculously expensive given American labour rates and the cost of shipping from Hawaii. It’s too bad because they have a special variety (Sugarloaf) which is exceptional! Low in acid and very sweet. We really wanted to bring a pineapple home with us but expected to need to purchase it from an inspected market (for export). We just missed the location from which we planned to buy them and ended up buying them from the airport for far too much money. Unfortunately they were from Maui! Again, why fly them from Maui when they grow on Kauai? Regardless, once we bought the pineapple I realised there was no “export approved” type label on the package. Since every piece of luggage leaving Kauai for the mainland is inspected by the US Dept of Agriculture we asked them if there was anything special about these “airport pineapples”…. no! So, for anyone flying to Hawaii, pick up pineapples anywhere and bring them home! We were cautioned that pineapple is the only fruit allowed back. This past weekend Tanny, Ella and I went to visit my family in Waterdown. We got to town a little early and decided to pay a visit to Simpler Thyme Organic Farm . We passed it the first time, seeing the brightly painted sign a little too late (crying baby in the back seat!) but when we turned around and drove into the farm we were happy to find a lovely little store and a very friendly and enthusiastic host Ann. Ann and her husband play host to many visitors to Canada, letting them exchange their time in the “gardens” for room and board. Their gardens are expansive and very well organised from what we could see. The day we were there a young man from Japan, one from Korea and a young women from Waterdown had just returned from picking asparagus. We readily picked some from their baskets and ate it the next night – delicious! We also bought some mixed salad greens and spinach. Excellent taste and very crisp – even after a few days in our fridge they are still fresher than grocery store produce. Makes me think we should have planted some lettuce in our garden. Simpler Thyme also carries produce from other farms, organic milk, grains and meats. They raise chickens for meat and eggs (about 200 and 100 respectively). 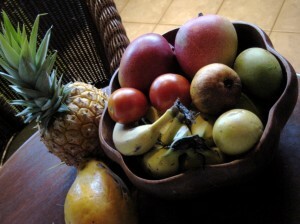 Anne publishes a weekly email newsletter detailing the activities on the farm and what produce is currently available. We received our first one on Tuesday. If you’re in Waterdown be sure to check them out. It’s Farmers’ Market Season Again! Since the start of the outdoor farmers’ market season, Josh, Ella and I have a new Saturday morning routine – we head down to Brick Works Farmers’ Market for some shopping and tasty treats. Even though it’s still early in the season, the market was already bustling with activities. Farmers selling asparagus, rhubarb (you gotta get there early), wild leek and baby greens; vendors selling organic and heirloom seedlings, specialty cheese, baked goods, handmade chocolates and delicious prepared foods; there were also workshops, live music and activities for kids. It was so nice to be shopping in an open air market, visiting the different vendors and sampling all the goodies. We had a late start last week and didn’t get to the market until 11. Unfortunately, most of the spring produce were sold out by then. So we just bought some bread from St John’s Bakery and a tomato seedling (red zebra, red with yellow stripes), just in case it doesn’t work out with our own seedlings. To cure our rumbling tummies, we bought burritos from two different vendors for a taste test: the ultimate breakfast burrito vs. the chorizo burrito. They were both freshly made and stuffed with scrumptious toppings. Josh and I thought they were both delicious. The ultimate breakfast burrito was lighter and zestier; the chorizo burrito was hearty and more substantial. Ella preferred the chorizo burrito, she kept asking for more. Starting next week, there’ll be a $5 charge for parking at the Brick Works , so I don’t think we’ll be visiting every week anymore. While they do offer a shuttle service from Davisville station and Broadview station, it’s too much trouble when you’re traveling with a one year old. Going to the Dufferin Grove market has become a regular outing around here. On Thursdays, Ella and I pick up Lina and we head to the market together. We usually share a delicious cinnamon bun from the café and walk around to check out what’s available that week. After reading an article on Andrew Akiwenzie in edible Toronto – he sells the fish he caught himself from Georgian Bay the day before the market – I was looking to buy some fresh fish from him at the market. I also wanted to buy some flour to make crackers this weekend, and some sweet potatoes. I ended up with all that and some sprouts and a loaf of lemon rosemary sourdough. I abandoned my original dinner plan of leftover Sheppard’s pie and made supper with my market purchases. For dinner, we had mixed green salad with broccoli sprouts, baked whitefish, steamed broccoli and bread. Pretty good for a last minute meal. We’re not on a strict local diet yet – the main ingredients from our dinners are usually locally sourced and I’m making a conscious choice to buy local when I’m at the grocery store. At times it is difficult to resist buying the strawberries and blueberries, but I’m holding out for the good stuff in the summer. Other than that, it hasn’t been too difficult and we’re eating better than ever. I’m definitely looking forward to spring more now that it represents a new growing season – I can’t wait to start my garden this year! Since I’ve started my research in local food resources in Toronto two weeks ago, I still haven’t visited any of the new findings myself. So last Thursday, I went to check out Toronto’s only year-round farmers’ market at Dufferin Grove Park. A market where there are strict guidelines in place to ensure that the vendors are the producer of their goods and most goods are certified organic. I was pleasantly surprised to learn that there’s a year-round farmers’ market in town. And even in mid-January, it’s still bustling with activities. I bought a pork tenderloin ($21) from Berreta Organics, arugula sprouts and basil ($9, I can’t remember the vendor’s name), home-made perogies (two bags of 6 large perogies for $10 total) from Sosnickis Organic Produce, and whole wheat sweet potato bread ($5) from Alli’s. I wanted to buy more but had to hold back, I had placed an order from Fresh From The Farm to be picked up on Friday (more about that later). Inspired by my purchases at the market, I prepared my first (mostly) local dinner. I made pan-fried perogies with sausages (non-local), mixed green salad with vinaigrette (olive oil, white wine vinegar and honey from an apiary in Wiarton that I bought while on vacation), and sweet potato bread. It was nothing fancy but the perogies were the best I’ve ever tasted, the salad was so fresh and the bread was very hearty although it would go better with soup. A good meal all around. On Friday, we had our friend Andrew who is visiting from BC, was over for dinner. I roasted the pork tenderloin with roasted root vegetables (a recipe I found on the foodnetwork website), served it with a mixed green salad and sweet potato bread. I used local honey and Ontario red wine in the marinade for the tenderloin, although not all the root vegetables (carrot, rutabaga, turnip and parsley root) were local, they were at least seasonal. Had I planned better, I could’ve bought them from the farmers’ market, but I ended up going to the local supermarket. The tenderloin was succulent and tender, and the root vegetables complimented it quite nicely. I’ve never had rutabaga, turnip or parsley root before, I’d always thought they looked weird and didn’t know how to cook them; however, in my quest to eat more locally and seasonally, I decided to give them a try. As it turned out, they are quite tasty. You are currently browsing the archives for the Farmers’ Market category.